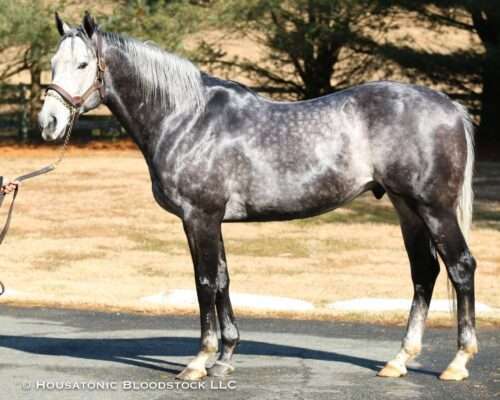 Blofeld (by Quality Road out of Storm Minstrel, by Storm Cat), was an undefeated multiple Graded stakes-winning juvenile by the hottest young stallion in the country today. He stands at Murmur Farm in Maryland. Blofeld broke his maiden first-time out going 5 furlongs at Saratoga as a well-bet 2-year-old with a big reputation, before stepping straight into Graded stakes company. He overcame a troubled trip to get up gamely in the Grade 2 Futurity at Belmont in his second start going 6 furlongs (and earning a 94 Beyer), and then stretched out to a mile and romped by five lengths in the Grade 2 Nashua at Aqueduct (with a 93 Beyer), closing out his juvenile campaign three-for-three. Blofeld started twice at 3, including a 3rd-place finish in the William Walker Stakes, and at 4 he returned to his best form to triumph in the Grade 2 Gulfstream Park Handicap going a mile over the likes of Stanford and Anchor Down, with a career top 103 Beyer. He retired with four wins from 14 starts, and $745,420 in earnings. A $135,000 weanling and then $275,000 yearling from the first crop of his sire (who sired a pair of 2017 Eclipse Award winners and will stand in 2019 for a live foal fee of $150,000 after siring five individual Grade 1 winners in 2018), Blofeld is from carefully-cultivated Ned Evans families on both the top and bottom sides of his pedigree (he shares a fourth dam with the 2017 Horse of the Year Gun Runner, and also has Horse of the Year Saint Liam in his female family). His pedigree is free of Dixie Union and Deputy Minister, whose daughters have provided Quality Road with much of his success thus far. A big, correct horse with plenty of leg and length, Blofeld entered stud in 2018. You can see more photos of him here.